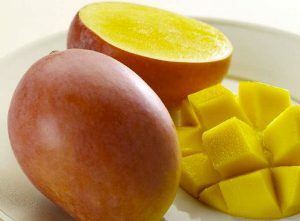 Calypso mango is a cross between a Kensington Pride Mango and the Sensation mango. It is scientifically known as the B74 variety. Perfection Fresh owns the marketing rights, while the Queensland Department of Agriculture and Fisheries and Just Avocados Pty Ltd developed and own the variety itself. The fruit has a sweet juicy flavor, small seed and a firm flesh with no stringy bits. The skin in yellowy orange with a pinkish blush, while the flesh is yellowish orange. The season for Calypso mango is between September and March.